The Bottom Line: The resurrection of Ellsworth’s popular hero Thaddeus Murfee is a great entry point for new fans. The first book in the new Justice Series finds Flagstaff, Arizona attorney Thaddeus Murfee agreeing to help Special Agent Donnie Francisco as he faces down the Vittini mob. 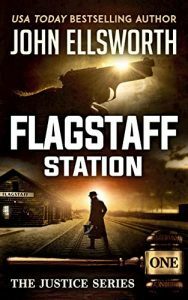 As you might imagine, Murfee soon finds himself in the crosshairs, and the warfare spans both the courtroom and deadly streets of small towns in Arizona. In the process, Ellsworth does what few novelists have done before him — write a highly entertaining novel that weaves in elements of Arizona tribal culture, which eventually lands Murfee in tribal court. Turquoise Murfee, Thaddeus’s police detective daughter, makes a discovery at Flagstaff Station that could trigger sudden death – but she doesn’t know what she has, and could inadvertently kill hundreds of innocent men, women, and children if Thaddeus doesn’t stop her in time. The result is a legal thriller with a world like no other, heavy on the action, while still involving enough legal drama for genre fans. Haven’t read Ellsworth? No problem. Readers with no prior knowledge of the Murfee character should have no problem picking this one up.